← Are Computer Models Reliable – Can they Predict Climate? Update: Some have queried the use of ‘alarmist’ in the headline, this was chosen becuase of the connection to 10:10 ‘No Pressure’ video,(here, here, here, here , and the rest of the civilised world) and 10:10’s message of 300,000 deaths due to climate change, despite no evidence of this. On the Anniversary of Climategate a CAGW alarmist has entered the Houses of Parliament……. “Bryony Worthington, Sandbag’s founder, has been appointed as a Labour peer in the UK Parliament’s House of Lords, recognising over a decade of work for effective action on climate change. Ed Milliband, who as Minister of State for the Department of Energy and Climate Change in the previous UK government, was responsible for introducing the 2008 Climate Change Act (80% reductions in CO2 by 2050) has brought Bryony into the House of Lords to help push the Climate Change Act that they both were instrumental in creating. Duncan Clark (10:10 Campaign Strategy Director), also writes for the Guardian in the Environment section. Bryony has written 27 articles for the Guardian on emmision trading 10:10, Copenhagen and climate change. Ed Gillespie her colleague at Sandbag, also writes for the Guardian. I imagine just this would be evidence of considerable man made global warming vested interests to many, yet this is just a small example of the many interlinked network of political, business, media, lobby group and personal connections that have built up over decades in the UK. This diagram is concerned with the following issues: is it in the interests of any of the parties concerned to question the science of anthropogenic climate change, or to dissent from the view that global warming is without doubt a major threat that can only be averted by urgent action. Bryony’s Sandbag colleague, Ed Gillespie, is also the co-founder (since 2001) of the Environmental Pr and Communications company Futerra. At some point, the following advice from Futerra appears to have been taken up by the Government and the UN, which is to behave as if climate change (presumably man made) is real, and the ‘facts’ taken for granted. This type of media communications strategy, I imagine was behind all the media and political messages that the ‘science was settled’. Bryony Worthington is the founder of Sandbag which is a campaigning organisation currently focused on emissions trading. A fellow director of Sandbag is Mike Mason who is also the Manging Director of JP Morgan Chase Climate Care, a carbon offsetting organisation. JP Morgan Climate Care along with Barclays Capital is one of the UK Governments approved gold standard providers of carbon offsets, maybe Prince Charles and Gordon Brown brought their Copenhagen ‘carbon offset’ from JP Morgan Chase Climate Care. So, in that graphic above, just this small group of people alone cover all the bases, some of them in 2, 3 or more areas, I imagine any reasonable person would concede that they have had considerable influence in shaping the man made global warming consensus. Ed Gillespie– Sandbag, Futerra, Guardian Environment, Commissionar for the London Sustainability Commision. Guardian – The entire Environment team have been the leading MSM advocates of CAGW for over a decade in the UK. The UK politicians will never have even heard of Michael Mann, Steve Mcintyre, Professor Lindzen, Professor Judith Curry, or any of the scientists involved, or have even heard of any of the blogs, such as RealClimate, Climate Audit, Watts Up With That, Bishop Hill, Climate Progres, etc and they will have no idea of any of the scientific debate or any uncertainties. With a self perpetuating network as described by the Harmless Sky, the UK politicians will never have encountered any other views outside of the ‘green bubble’ they operate in. At some point, the AGW consensus started believing their own media messages about ‘climate change deniers’ funded by big fossil fuel lobby groups and totally disengaged from anything that went against the consensus. Thus, in this self perpetuating ‘green bubble’ the politicians and ALL the now vested interest groups lost touch. For futher evidence of this green bubble you need to look no further than the intelligent creative group of people involved in the 10:10 Campaign, that created the ‘No Pressure’ video PR disaster, with the belief that it would actually help get the climate change message across. 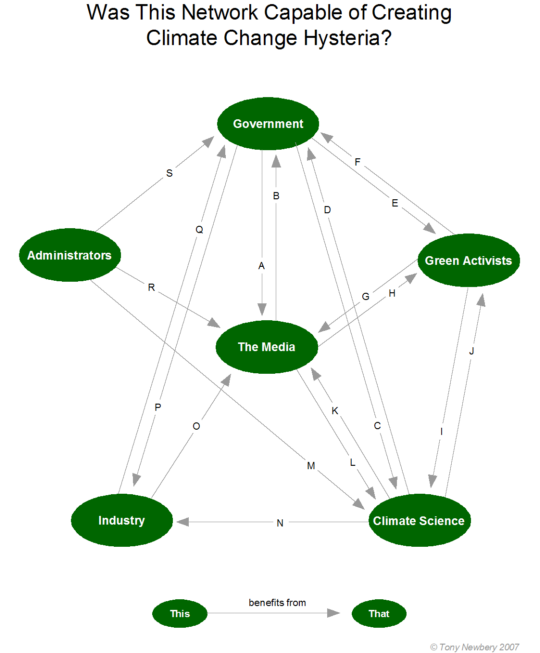 Far from the 10:10 Campaign being a small, badly connected ‘climate change’ group with no influence, the evidence above shows the opposite with strong connections across media, business, lobby groups and in the political arena. So no conspiracy required, just human nature explains the network of people perpetuating the catstrophic man made global warming popular delusion. 5 Responses to Climate Connections – An Alarmist in the Houses of Parliament? Congratulations and good luck with the blog. The strange interaction between the people and organisations that you mention are well worth exploring. So far as I know the Futerra connection with DEFRA, which led to the Warm Words report, was via the IPPR, of which the Milibands and Patricial Hewitt were alumni. The latter was very vocal about climate change as a junior minister and the IPPR was influential in guiding government policy during the crucial 200607 period when climate alarm began to move centre stage. Thanks for the info, Futerra seems to have adviced nearly everybody at some point. Arrived here via your Bishop Hill link. I’ve enjoyed your posts there and look forward to enjoying even more of them at your own gaff. Hope you don’t mind, this is a great piece BWoods BTW, thank you!